How do you represent health services in informal settlements? 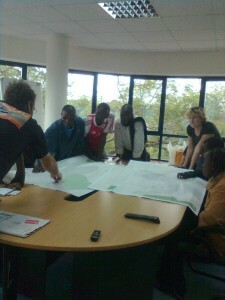 As the Map Kibera project moves into the second phase, the team’s mapping activities become more focused. For the next week mappers will be collecting Health Service data. They will concentrate on ensuring that all of the information pertaining to Health and Health Services is as detailed as possible and that it is accurate and up-to-date. That’s where I come into the picture. During the previous data collection phase, Health Facility information was collected, however it was not standardized. Using the Kenya Master Facilities List (MFL – a project of the Ministry of Health Services) as a guide, and the Wikipedia article on Healthcare in Kenya, a data collection form was developed to capture information about each individual Health Service located in Kibera. An interesting point to note is that, at present, the MFL website does not include definitions for each facility type (i.e. what characteristics makes a Health Centre a Health Centre vs a Medical Clinic or a Nursing Home) and the website of the Ministry of Health Services is down. The Wikipedia article contained the most comprehensive information I could locate in terms of definitions. Additionally, the MFL project has not yet determined how to incorporate Community Based service provider data into their classification schema, not-to-mention how to go about collecting this data. The data collection guide the Map Kibera mappers will use is thus a modified version of the MFL classifications, tailored to the needs and realities of Health Services in Kibera. Today, Mikel, Erica and I sat down with the mappers and had an in-depth discussion of the data collection form. It is this discussion of the realities of Health Services in Kibera that really intrigued me. As expected, the most challenging aspect of data collect will be determining which Service (or Facility) Type each point of interest really is. This is due in part to the lack of a clear, publicly available definition of characteristics for each service type, as well as the discrepancies between the medical community’s definition of each health facility and the community definition of the same facilities. For example, what exactly is a Health Centre? How many clinical officers or medical officers must be on staff at a Health Centre? How is this different from a Dispensary? The most contested distinction was that of dispensary vs pharmacy vs chemist. In the MFL, only dispensaries are listed. Should all chemists and pharmacies and dispensaries thus be called dispensaries? The mappers were clear that the answer is “no”. In Kibera, a pharmacy is a dispensing facility, usually located in a hospital; a dispensary can be large – as large as a Health Centre – and provide diagnostic and treatment services, or a dispensary can be small and serve functions, including but not limited to dispensing (no clear conclusion was reached on this); a chemist is a private operation that dispenses drugs (both prescription and over-the-counter drugs). One caveat – a chemist in Kibera often operates as a Medical Clinic, with an exam room in the back of the facility. The catch is that these ‘chemists’ are not licensed as clinics – often there is not even a certified pharmacist working in the “chemist” and the drugs are supplied to the facility by people who work at the larger hospitals outside Kibera and are seeking to make a profit by selling drugs at a cheaper cost inside the informal settlement. How can these distinctions be visualized on a map? Should they be? What is the role of such ‘backdoor’ operations? Which definition should be used in order to add value to other on-going processes while also ensuring that the data are valuable to the local community? This is food for thought. Another point of interest for me is that a Nursing Home (which in North America is a rest home for the elderly) in Kenya functions as a large, well-equipped, privately owned hospital. The mappers all knew exactly what a Nursing Home is, and did not need to hear the Wikipedia definition (which I did not even clearly understand). This just goes to show, things are not always what you expect them to be. Your observation is very right. Same notion was expressed in what was supposed be a very comprehensive typology (See Noor, A. M., Gikandi, P. W., Hay, S. I., Muga, R. O., & Snow, R. W. (2004). Creating spatially defined databases for equitable health service planning in low-income countries: the example of Kenya. Acta Tropica, 91(3), 239-251).Two distinct typologies – one for government(official, public) and the strictly for private sector (unofficial). No such facilities recognized as maternity and nursing home, so how are they registered? regulated? and without so, what service are the users of these facilities getting? Is it contributing to expected health care goals? This only escalates the health inequalities already existing in the slums. It is the onus of the MOH to put this straight, more so for a realistic policy drive. You cannot exclude such a significant population with the structures that serve them (right or wrong). Kibera, Korogocho, Mathare …..are inhabited by Kenyans, and voters for that matter, we legitimize the authority of our leaders. You are currently reading How do you represent health services in informal settlements? at Map Kibera.